We are all more or less familiar with the French terms marchand and marché de l’art, used to refer to the dealer and his or her relationship with an artist for the promotion and sale of their work, but thanks to the influence of the English word ‘merchandising‘ the term has taken on a new meaning. Our colleagues in the Museu Picasso shop a are good example of this. More than 330 m2 devoted to art, to Picasso and to the city of Barcelona make up this particular Picassian universe. There is a wide variety of items on sale here, with something for all tastes and all budgets. Marta, Raquel and Manel, who run the Museum shop, and welcome us inside, are real specialists: they visit trade fairs, they explore the shops at other leading museums around the world and, above all, they are experts in the art of merchandising. This is precisely what we find in the Museum shop: a wide range of objects associated with Picasso and his work (books, guides, reproductions on paper and in bronze, headscarves and T-shirts), with art in general and with other artists, with Barcelona and the artist’s relationship with the city… as we said, something for everyone. The fact is it’s important that the artist should be able to connect with people by way of other media such as postcards, reproductions, or even a coffee mug – objects that make the visitor want to know more about his work and understand it better. It is a way to living with this particular artist and with art in general. The Museu Picasso de Barcelona Shop and Bookstore. 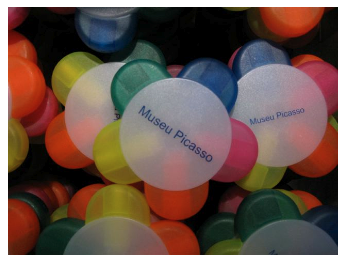 The Museum shop aims to be a point of reference for experts and for Picasso fans and lovers of art in general. It has a database of 323,000 titles, of which 36,000 are books about art and about Barcelona. Marta, Raquel and Manel are quite clear about what they have to offer. ‘We don’t want to be a souvenir shop, we think of ourselves as an art shop for everyone and every pocket.’ The prices of the items on sale vary widely to suit the different types of visitors and their different budgets. For the more demanding-and well-heeled-one book stands out: La Celestina with illustrations by Picasso. There is also Limoges porcelain, and silk headscarves made in Italy. For those with an interest in and a knowledge of art, the excellent range of exhibition catalogues. Younger visitors will find games and books to introduce them to art and Picasso. And everyone will want to send postcards to family and friends – to give you some idea, there are ‘only’ about 5,000 different postcards! An interesting point here for museum managers is that specific events and changes in the location of the works in the museum have a direct impact on the shop: ‘For example, when the painting Las Meninas was away on loan to exhibitions in Paris and London, sales of reproductions dropped by 50%. On the other hand, since Woman with a Mantilla was moved to a much more visible location sales have tripled.’ Clear evidence, then, that what we see on our visit to a museum will influence the things we buy to remind us of it. Who could resist the urge to draw with these markers? An interesting discussion is now going on, started by Lionell Borean on Linkedin, about “Which is the best museum store you have visited?” (direct access if you are a Linkedin user, if not, you’ll need to register first). What do you buy in a museum shop? What’s your personal favourite? M’agraden molts objectes de les botigues dels museus, però per a mi el mes interessant son els cartells de les exposicions, pens que es un bon record, fins i tot tenc alguns a la paret de casa. Després vam passar per la Botiga i vam comprovar que en la majoria d’articles l’etiqueta informativa del producte i preu estava en “anglès”; tot i no rebutjar-ho, no és acceptable que no sigui en català. En el mateix moment vam expressar la nostra queixa al personal de caixa. És incomprensible !!! en tot cas primer en català i després el que calgui.